The world of bar theatrics has grown apace in the past 20 years. From bottle flinging to fire shows, to the more subtle world of professional mixology, we take a look at how these trends are translating to the high-street and, as trends develop, our University bars. 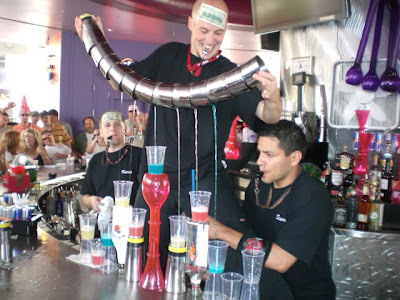 Sadly, it is almost impossible to tackle the subject of the world of bar theatrics without a nod to the 1988 Tom Cruise film, Cocktail. The bottle-slinging antics of the 1980’s favourite New York bartender are now known as flair bartending. The art of flair has come on leaps and bounds since that film was released to popular acclaim, with notable surges of interest in the early 1990’s, and more recently from the turn of the century. Bartenders can now be found performing in bars around the world, demonstrating their skills in highly regulated competitions for fiercely contended titles and prizes, and I should know: I used to be one of them. 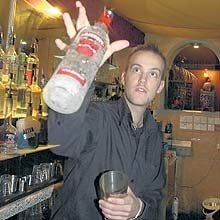 In my bartending years, I found this unique approach to what is, let’s face it, not a highly regarded job in the UK, to be a refreshing change. The bartender was no longer an invisible part of bar culture, but in fact quite the opposite. We took the bar as our stage, the customers as our audience, and pulled out all the stops to impress them, creating an electric atmosphere in the bars we tended as we worked. In competitions, each bartender was given a strictly limited time period (usually five minutes) to create one or more drinks in the most impressive and innovative way possible. The result was two-fold. On the positive side, bartenders now felt valued, and would spend many hours each week perfecting their skills, often (neigh, usually) outside of work hours in order to achieve recognition for their expertise. This, in my humble opinion, was a great thing, and added to the professionalism of the trade. On the down side, it is fair to say that many of the bartenders involved forgot the main goal of the bartender: to serve and entertain their customers. 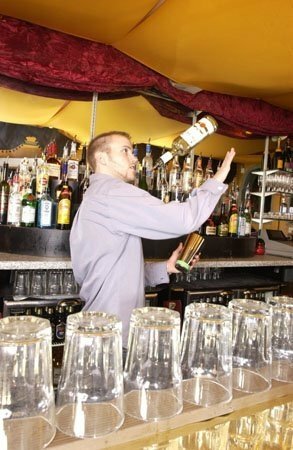 In the worst cases, this would lead to the bartender’s ego getting in the way of their job, with them preferring to show off than get the job done. Customers spending what felt like hours waiting for a bartender to produce each drink in the hope of impressing a crowd led to long delays, and irritatingly poor service. This leads to the oft-asked question: what is flair? In competition terms, this is an easy definition: we can simply look at judging criteria of the competitions to see what traits are valued. Technical ability, originality, choreography and crowd interaction would all score highly. But in a more commercial environment – a university bar, for example – the criteria changes. Here, an expert bartender should be able to move quickly and efficiently within their environment, producing the right drinks for the right people at the right time, minimising both wastage and wait times as they do so. In my bartending days, I qualified in second place for one of the World Flair competitions (somewhat like boxing, there are many different associations around the world offering these titles). 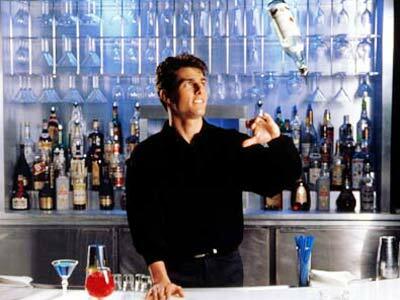 Whether I, or my fellow competitors, could be considered the best bartenders in the world, is quite another question. To see this art put to its best use, a trip to Las Vegas is almost essential (which is a good excuse for a trip, if ever I heard one!). Here, the bartenders are interesting, entertaining, and most importantly completely focussed on ensuring their customers are having a great time. Flair bartending, and a great customer experience, need not be mutually exclusive. The bottom line is that a bartender who moves with confidence and efficiency makes your bar look infinitely more professional that simply having someone throwing bottles around. By way of engaging customers in this process, many bars now offer bartending tutorials. This is a fantastic idea, both providing your customers with an idea of the level of training required to make cocktails well, and providing you a unique level on which to engage with your audience. Inviting the customer behind the bar during these sessions will encourage them to experiment with the drinks you are offering, perhaps discovering new favourites along the way. This in turn can lead to a greater uptake of some of your more exciting drinks, instantly providing you with a point of difference from your high-street competitors, and in turn a sense of customer loyalty. If you decide upon taking this route then work carefully on a session plan, making sure to cover the basics first, and do not assume that everyone knows how to handle your industry-standard equipment. Above all, make it entertaining for them. Remember, they’re not actually your staff!